This page provides complete information about a community plan update that was sponsored by the Greater Pine Island Civic Association. COMMUNITY PLAN UPDATE as adopted on 1/9/03: Download Lee County Ordinance 03-03, amending the Lee Plan to incorporate the Greater Pine Island Community Plan Update; or download the codified version of the Lee Plan's special provisions for Greater Pine Island. In October 2005, additional amendments were made by Lee County; download Lee County Ordinance 05-21 or the latest codification of special provisions for Greater Pine Island. Tourist-oriented directions signs are now permissible on Greater Pine Island -- see Lee County Administrative Code AC-11-18. A final public hearing was held by the Lee County Commission on the proposed implementing regulations for the Greater Pine Island Community Plan on May 29, 2007. The new regulations were adopted unanimously; Ordinance 07-19 is now available in searchable format or as a signed copy directly from Lee County. Backup material from the Greater Pine Island Civic Association is available here. Another revised draft of proposed implementing regulations for the Greater Pine Island Community Plan is now being reviewed by county staff; this draft is dated November 28, 2006. Previous drafts were dated September 27, 2006 and June 30, 2006. 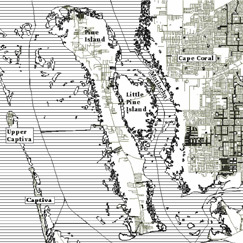 An excerpt of the codified Lee Plan policies and maps that govern Greater Pine Island is available here; this codification includes the latest changes made by Lee County in late 2005. The plan on which the latest updates were based is available here. The Lee County Board of Commissioners unanimously ordered immediate implementation of the Greater Pine Island Community Plan after a public hearing on March 14. This decision echoed the advice of Lee County's Local Planning Agency on February 27 and overturned a recommendation by the county attorney and planning director that would have allowed an unlimited number of new residential subdivisions to be created on Pine Island as long as no single subdivision would have used up all remaining traffic capacity on Pine Island Road. The Commissioners instead endorsed a recommendation by the community development director to apply the adopted growth management measures to all new subdivision applications. Both recommendations were generated by an "Annotations Committee" at the request of the county commission. The Lee County Commission held a public hearing on October 12, 2005, to consider amendments to the Lee County Comprehensive Plan; the final staff report is available here. The amendments were approved by Ordinance 05-21 and will become effective shortly. These amendments modify the Lee Plan's special provisions for Greater Pine Island. These amendments are numbered CPA-2004-16; they had been discussed by the Local Planning Agency on May 23 and the county commission previously on June 1. This amendment modifies the goals, objectives, and policies in the Greater Pine Island Community Plan through a series of compromise proposals formulated by county staff after meetings last fall with major landowners and farmers who have objected to portions of the new plan, which was updated by the county in early 2003. LPA members voted 3-1 to support this amendment in full. The County Commission voted unanimously to support this amendment on June 1; it was later reviewed by the Florida Department of Community Affairs, whose comments are reprinted in the final staff report. On October 12, 2005, the amendments received their final approval by the County Commission through Ordinance 05-21. Final staff report; this report describes the proposals in detail. The staff report is very complex, especially for those who haven't followed the minutiae of the Greater Pine Island planning process. Bottom line, the county planning staff has done an excellent job in looking for ways to provide relief to landowners without too heavily compromising the integrity of the planning work that has come before. At the same time, the report includes some erroneous statements that should not go unchallenged. First, the report cites the Hanson Report as if its conclusions were based on reliable facts. For instance, Hanson's conclusions are based on the careless and unwarranted assumption that restoration of Pine Island farmland to native habitats would cost $20,000 to $40,000 per acre. In fact, restoration would be in the $4,000 per acre range, making restoration an economically feasible alternative to continued farming or to reduced density on "Coastal Rural" land. Second, the report includes a gratuitous statement that new residential development orders will not be limited until traffic levels on Pine Island Road get much higher than they are at present, thus echoing the county attorney's office incorrect interpretation of the 910 Rule in Policy 14.2.2. A summary of the changes that are proposed in this report is also available, along with preliminary comments about the substance of each. A majority of these changes are either positive for the planning process or are acceptable alternatives if they are not further weakened during the public hearing process. A SECOND PROPOSED AMENDMENT had been numbered CPA-2004-05. This proposal was made by the Pine Island Agriculture & Landowners Association to increase the amount of traffic allowed through Matlacha before the 810/910 rules take effect. The practical impacts of granting this request would be to effectively suspend the current 810/910 development restrictions for perhaps 14 more years (if current traffic trends continue). The planning staff report is available here; a graph showing the practical impacts of this request is available here. Lee County's Local Planning Agency considered this amendment request on March 28; they voted 3-1 to recommend that the county commissioners NOT approve this amendment. The County Commission voted unanimously on June 1 to reject this amendment; it therefore was not be transmitted to the Florida Department of Community Affairs and no further public hearings will be held. Cost estimates for restoration of farmland on Pine Island, prepared by Kevin Erwin of Kevin L. Erwin Consulting Ecologist, Inc.
Board of County Commissioners' agenda item for November 23, 2004 regarding a staff-initiated reevaluation of the new Coastal Rural category and a proposed special amendment to the Lee Plan. This agenda item was approved as requested by county staff; the result will be a formal review of county-initiated proposals regarding various provisions of the Greater Pine Island Community Plan, resulting in a compromise proposal heard by the County Commission on June 1, 2005 (see full discussion above). Discussion regarding implementation of the "910 rule" in Lee Plan Policy 14.2.2. Pine Island Suit Dropped -- article in Fort Myers News-Press on November 13, 2004. As a result of this action, Administrative Law Judge Ruff has closed this case. Joint opinion from attorneys Tom Reese and Ralf Brookes describing six erroneous real estate value assumptions in the Hanson report and opining that the report does not provide a basis for Bert Harris Act claims against Lee County. News-Press editorial on September 25: "Let Islanders have their say about plan"
Planning staff memo concerning September 28 meeting. Conservancy of Southwest Florida letter to county commissioners. Spikowski September 22 letter to county commissioners. Spikowski September 24 letter to county commissioners. Response from Hanson Real Estate Advisors to questions from county staff, dated September 21, 2004. Memorandum from Lee County DOT documenting current traffic levels in Matlacha at 937 peak-hour trips, in excess of the 910 threshold in Lee Plan Policy 14.2.2. This conclusion is contained in Lee County's Concurrency Management Inventory and Projections, 2003/04--2004/05, as approved by the Lee County Commission on September 14, 2004. Backup material for August 2, 2004, discussion before the Lee County Commission concerning the "910 rule" restricting further residential development orders on Greater Pine Island. Greater Pine Island Community Plan Update -- complete report, dated September 30, 2001. Lee County Ordinance 03-03, amending the Lee Plan to incorporate the Greater Pine Island Community Plan Update; or download the codified version of the Lee Plan's special provisions for Greater Pine Island. The Florida Division of Administrative Hearings received a legal challenge to Ordinance 03-03. The administrative hearing on this challenge that had been scheduled for November 29 through December 3, 2004, has been cancelled; Administrative Law Judge Ruff has formally closed this case. Original draft of proposed implementing regulations for the Greater Pine Island Community Plan Update:. NOTE: A later draft of these regulations is available here. Results of a 2001 survey of Pine Islanders' views about the topics in this plan. The contract between Lee County and the Greater Pine Island Civic Association to fund the implementation phase was approved on May 27, 2003. Feature article on Greater Pine Island's character and controversies (12-22-03). Download a previous agenda summary for Lee County Commission to consider whether to rescind the Greater Pine Island Community Plan Update. This item had been scheduled for their December 9, 2003, meeting but the commissioners decided on December 2 to delay it to a date to be announced. The Greater Pine Island Land Use Plan Implementation Committee met on March 4, 2004. The main topic for this meeting was a final review of proposed implementing language for three of the seven policies in the Greater Pine Island Community Plan Update. (Final language for the remaining four policies was tentatively approved at the January 14 meeting.) The complete background material for this meeting is available here; copies were also be available at the meeting and at the Chamber of Commerce and Pine Island Library. Draft minutes of the meeting are available here. At that meeting, the final three sets of proposed regulations were tentatively approved by committee members (see above). The previous meeting of the Greater Pine Island Land Use Plan Implementation Committee was held on January 14, 2004. The topics of discussion were further details of proposed regulations for implementing the 2003 land use plan update. The complete background material for that meeting is available here. The minutes of that meeting, as corrected at the March 2004 meeting, are available here. At that meeting, the first four sets of proposed regulations were tentatively approved by committee members (see above). The previous meeting of the Greater Pine Island Land Use Plan Implementation Committee was held on December 10, 2003. The topics of discussion were an open forum on planning for Greater Pine Island, plus further details of proposed regulations for implementing the 2003 land use plan update. The complete background material for that meeting is available here. The minutes of that meeting, as corrected at the January 2004 meeting, are available here. The previous meeting of the Greater Pine Island Land Use Plan Implementation Committee was held on November 12, 2003. The complete background material for that meeting can be downloaded here. The minutes are available here. The cover memo plus a list of major changes in the implementing language, an agenda, the draft minutes from October 8, and a letter clarifying statements made on October 8, is available here separately. The previous meeting of the Greater Pine Island Land Use Plan Implementation Committee was held on October 8, 2003. The complete background material for this meeting can be downloaded here. A follow-up letter that describes various benefits that this plan provides to landowners is available here. A copy of the minutes is available here. The cover memo is available here separately. First attachment is the meeting agenda for October 8 with the draft minutes of prior meetings. The previous meeting of the Greater Pine Island Land Use Plan Implementation Committee was held on August 13, 2003. The complete background material for that meeting can be downloaded here. An approved copy of the minutes is available here. First attachment is the meeting agenda for August 13. The previous meeting of the Greater Pine Island Land Use Plan Implementation Committee was held on Wednesday, June 11, 2003. The complete background material for that meeting can be downloaded here. An approved copy of the minutes is available here, and here for the organizational meeting on April 9. The cover memo (only) is available here. The first attachment is a copy of Lee County Ordinance 03-03 that adopted the Greater Pine Island Community Plan Update. This adopted language contains some changes from the language originally proposed in the plan document, so please refer to this ordinance for the exact language that is now in the Lee County Comprehensive Plan. Download this attachment here. The second attachment is the draft contract between Lee County and the Greater Pine Island Civic Association that will provide funds to support this project. This contract was approved by the Board of County Commissioners on May 27 and is now being signed by both parties. The only change to this draft is that the completion date of July 2003 is being changed to July 2004 (see page 6 of 7). Download this attachment here. As indicated in this contract, there are seven sets of amendments to Lee County's Land Development Code that are required to implement the community plan update. On June 11 we will go over an early draft of two sets of those amendments, which would implement Policies 14.3.3 and 14.3.5. Download 14.3.3 here, and download 14.3.5 here. The establishment of a new "Coastal Rural" future land use category, as described in new Policy 1.4.7. Amend the Future Land Use Map series to reclassify 157 acres of agricultural land between Bokeelia and September Estates from "Outlying Suburban" to "Coastal Rural." Reclassify all land on Pine Island now designated as "Rural" to "Coastal Rural." Replace the existing vision statement for Pine Island in Chapter I of the Lee Plan with the new vision statement. Modify Policies 14.1.5, 14.1.7, 14.2.2, 14.2.3, and 14.3.3. Add new Policies 14.1.8, 14.2.4,14.3.5, 14.4.3, 14.4.4, 14.4.5, and 14.5.4. On March 11, 2003, the Florida Department of Community Affairs (DCA) issued its notice of intent to find the Greater Pine Island Community Plan Update "in compliance" with state law. On March 31, a petition was filed with DCA challenging this finding and requesting an administrative hearing. This petition was filed by Russell M. Setti and Eagles Landing at Pine Island, Inc.
Florida Planning and Zoning Association. The full plan document can be dowloaded below. The history of this planning effort is described below. At their September 5, 2002, public hearing, the Lee County board of county commissioners voted to transmit this entire community plan update for formal review by state and regional agencies (see newspaper article on this hearing). A public notice for that hearing and the meeting agenda are both available here. The revised staff report is available directly from Lee County. You may download a copy of a letter to each county commissioners dated September 3, 2002, that explains the final issues that were expected to arise on September 5. The first public hearing on the Greater Pine Island community plan update was held before Lee County's local planning agency on March 25, 2002; the agency heard a presentation about the plan and accepted extensive public testimony. A newspaper account is available here. The second public hearing was held on April 22, at which time the plan update was unanimously recommended for adoption by local planning agency members. Click here for a full copy of the final community plan update for Greater Pine Island, which is dated September 30, 2001. Note that this file is large, about 4.7 MB, and you must be patient during the download period. A smaller version of this file, about 1.3 MB, is also available; this version is suitable for viewing on screen but has lower-quality graphics; click here for this smaller version. Color copies of the future land use map, as adopted now and with the proposed changes, are available from Lee County's web site; a map of existing land uses is also available. The steering committee for this plan update met on September 25, 2001, to consider public input that was received on September 19. Click here to review a synopsis of public input from the public presentation on September 19 and the committee's response to each item. In preparation for public hearings, various county staff agencies have reviewed the plan update and submitted written comments. Those comments and responses to each can be downloaded by clicking here. Click here for a printable copy of just the table of contents. The final public presentation on this plan update was held on September 19, 2001. Click here to review a synopsis of public input during this presentation and the steering committee's response to each item. A smaller file of the September 1 draft of this plan can be downloaded by clicking here. This file that contains the entire text of the report, but with the photographs compressed to quicken the download period. This file is about 1.9 MB. To download the background material for the steering committee meeting held on August 14, click here. To download the background material for the steering committee meeting on July 10, click here. A second public presentation on this plan update was held on April 24, 2001. An on-line newspaper report is available from the Pine Island News. A full draft of the April 12, 2001, draft if this plan update is available by clicking here. The first public presentation was held on February 6, 2001. An on-line newspaper report is available from the Pine Island News. An earlier draft of the plan update, dated January 10, 2001, is also available.